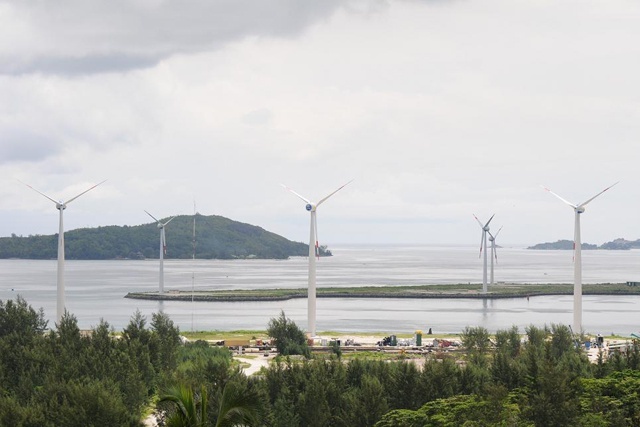 (Seychelles News Agency) - With a target of producing 15 percent of electricity generation from renewable energy sources by 2030, the Seychelles islands are taking steps the meet their target, as the islands are producing 2.2 percent of energy consumed from wind power. The tall wind turbines which can be seen on arrival into Port Victoria have been producing clean energy for the Seychelles islands for the last 12 months, as part of the Indian Ocean archipelago’s first large scale renewable energy project. Consisting of eight giant wind turbines, the wind farm project is said to have been built to provide electricity to more than 2,000 homes. One year after it was commissioned, is the Port Victoria wind farm, consisting of 3 wind turbines on reclaimed land of Ile Du Port and 5 on reclaimed land of Ile de Romainville producing the envisioned amount of electricity? According to PUC, the wind turbines are producing enough electricity to supply the intended 2,200 homes, surpassing expectations. PUC’s Chief Executive Philip Morin told SNA that at any instant, the five turbines at Ile de Romainville and three at Ile du Port can each yield 750 kw each, making a total of 6,000 kw. However that is not always the case, as output depends on wind velocity. Morin said that turbine production runs into an average 8 million Kw/hour per year, compared to national energy need of 375 million kw/hour which means that the wind farm is presently meeting about 2.2 percent of total consumption. That translates into a saving of Rs 24 million ($ 2 million) yearly for the national economy. The project was funded by the Government of the United Arab Emirates, which delegated its energy company MASDAR to oversee the project, until it’s handing over to PUC in June 2013. Morin said that the wind turbines, installed by the South Korean contractors, Unison, represent advanced state of the art technology and have been running very well. "There have been no major issues, such as noise, vibration and killing of seabirds, fears expressed in some quarters, which have proved to be totally inaccurate." Morin said that since the corporation needs time to master the technology, three Koreans remain in Seychelles as part of the initial contract to help run the project until next year. "These are not simple blades turning. It is rather complex and a bit of a challenge to work reliably," he said. Five PUC engineers and technicians who had gone to South Korea for training last year have since returned. The Korean engineers are also running classroom classes, with theory and practical sessions for other PUC personnel, three of whom will also be sent to Seoul soon for more advanced training. In spite the wind farm being able to meet the intended 2.2 percent of Seychelles’ total consumption it is clear that more needs to be done and more can be done to tap into renewable energy to produce electricity for the island nation. 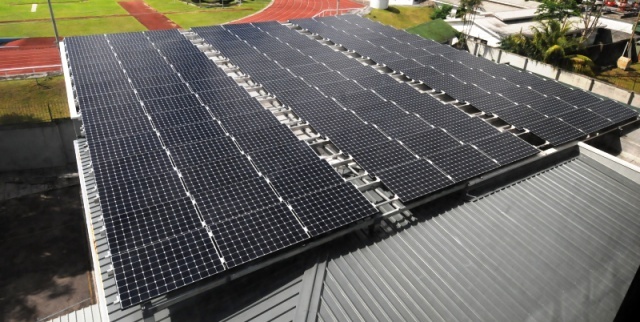 In an effort to make better use of the almost all year round sunshine in Seychelles, a new project to encourage more people to install photovoltaic systems to power their homes and businesses was launched in May providing for a 35 percent financial rebate to domestic and commercial entities alike on any PV system up to 3 kilowatt peak (kWp). PUC is also working to make renewable energy an affordable reality in the Indian Ocean islands. Morin told SNA that PUC intends to pursue its renewable energy programme with solar photovoltaic arrays amongst the wind turbines on Romainville, which may be left to private investment. Meanwhile, the Public Utilities Corporation is carrying out an ongoing study to assess how its power grid would react when connected to the photovoltaic array. Already, hundreds of ventures and homes are using solar energy, by installing, with the approval of PUC and the Seychelles Energy Commission, micro-sized photovoltaic panels on their rooftops. All that is contributing to slashing utilities bills and reducing demand on the PUC power network. Morin admits that PUC is presently unable to supply electricity to half a dozen tourism resorts, notably in the Southern and Western parts of the main island of Mahé until it improves its transmission and distribution network. "We must now concentrate on boosting capacity at our power stations. That means updating out plants and reinforcing our transmission and distribution grid. Our grid is weak in south Mahé"
Morin did not hide the fact that some PUC generators are very old. While the main power station at Roche Caiman, has nine generators all dating from the year 2000 onward, the second one at the Victoria commercial port has seven, some as old as 1972. "They are not very reliable or efficient," he told SNA adding that the corporation plans to acquire two new generators to meet rising demand, with the opening of two new large hotels in the Beau Vallon -Belombre area in northern part of Mahé. The CEO of PUC noted that a similar situation prevails on Seychelles second most populated island of Praslin, where two resorts, "Lemuria" on the west coast and "Raffles" on the east have their own generators. This results in higher production costs for the hotels, as they use diesel, a light fuel oil, compared to the heavy fuel used by PUC which is cheaper. Earlier this week the Seychelles Ministry of Environment and Energy announced a 3 cents increase (0.03 Seychelles Rupees) in electricity tariff effective July 01. PUC relies heavily on fuel to power its generators in order to satisfy the electricity needs of the Seychelles archipelago of around 90, 000 people which amounts to some 375 million kw/hour of electricity per year. Correction: Original article posted said that Seychelles had a target of 5% electricity generation from renewable energy by 2020. The correct figures are 15% by 2030.